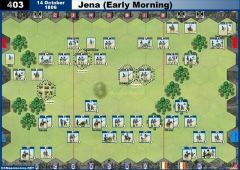 Thanks for those clarifications Bangla - I've been wanting to play more Napo since it is the least played of all my C&C games. I knew I would make many mistakes like this and unfortunately we didn't catch some of those. The more I play this the more I like it so I should eventually get it all down like the other C&C games. Game 1 started with a lot of mixed action on both flanks, punctuated with artillery blasts from the center. Slowly the French built up their center cards (had both Bayonet Charges) and double waved the Brit center and heights avoiding most of their deadly ranged fire. Game 2 saw a lot of action on the French right to start. They were getting some traction there before the push petered out. I though if they pushed a little more there they could have done some major damage, as the Brits didn't have many good cards to counter at that point. The French then switched to the center push, but were ground down and repulsed multiple times. We had some 'vassal issues' as well that game. All in all both games were fun to play. Looking forward to the rest. Thanks Anton. 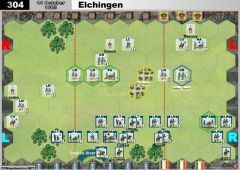 The game soon developed into a full-scale French infantry assault up the Centre/French Right. 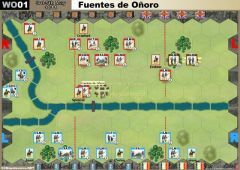 The British managed to hold the line, reducing several of the French attacking units to 1 or 2 blocks but as the dust settled, game banners were 4:1 to the French. 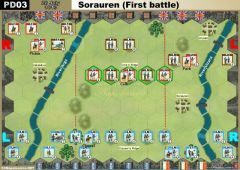 British re-inforcements from the centre then made a counter-attack, essentially amounting to one light infantry unit that could reach the weakened French right. 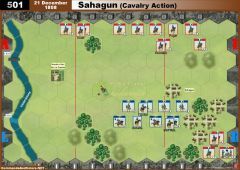 At this point, lady lucky intervened, as a French cavalry charge on the British artillery was repulsed against the odds and the British Light unit wiped out the one nearby full-strength French Line that could have held them off. The final banner fell to the British as the same Light unit mopped up one of the single block French. An interesting encounter, with the British under pressure very early on and the French constantly cycling weakened units out of the front line whilst trying to keep up that pressure. We both struggled with "the wrong cards" but, curiously, we both got to play three identical key tactician cards during the game to support the infantry battle. Due to disconnects, I had to stitch the attached log file together from several interrupted log files, so bear this in mind if you replay it. Last edit: 7 months 1 week ago by RiverWanderer. Reason: Remove template heading. Thanks, Chris. It was interesting to watch the tactics unfold. 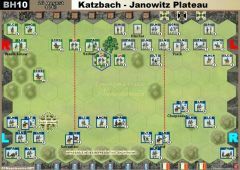 One more block would have given me another victory point as French, and I only wish I would have had a Bayonet Charge or another forced March; I probably could have smashed through the left side of your center line and then turned and eliminated the left flank. Oh well. 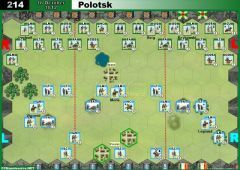 I was holding Give Them Cold Steel, but could not get my troops into proper position at the start of a turn to use it. Usually you rolled flags and pushed me back. Good job, though. It was fun for my first tournament game. Re Cold Steel... I find this one of the hardest cards to get value out of. 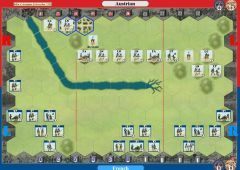 In my game, I ended up playing it to give one last hurrah to a single block infantry unit against a two block infantry. Both games see no action at all ın the french left section. 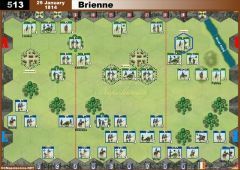 In the first game the Brıtısh moved very quickly to the front using several Tactics cards and Grand Man. The action resolved mostly at the center, then the Allies charged from their left sectıon and crossing the river attacked the french from their right. Calling the GG forward to the action at the boundary of the center and the rıght sectıon helped the Allies to secure the victory. In the second game the French this time pushed from the center and their right flank. The artillery were very sharp and the french were very eager to melee. They decided to attack the allied artillery, which was repositioned at the center on the hill. An uncalled for luck was for the french side. They were hitting very well. The french attacked the allies on the central hills and were able to destroy first the art and then the whole group. The allies were demoralized due to the early loss of their leader during artillery fire together with his unit. Thanks to John for being such a nice gentlemen, when his dice were really killing him. Brits played the skulking game, and picked up a few early banners, including both French HC. British LC shot down to French Bombard as he attempted to escape over hill. 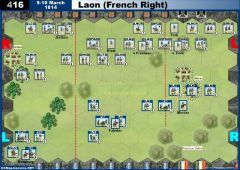 French Left was ongoing disaster for both sides, French losing 2 HC, 2 LN + Ldr and the Brits 1 LC, 1 LN (who failed utterly) and 1 LT who failed to get 1 hit on a 1 block ART, and was knocked out with 3 INF out of 3. Action switched to the centre, with French getting 3 ART out of 3d for an ART kill, and picked off a 1 block RF in the woods on 1d. Brit GG then came up and finished it. Last edit: 7 months 3 days ago by Mark-McG. If anyone has not contacted their opponent yet and has not arranged their match times, could you please contact me via PM or email. Center quiet all game. On French left, British crossing river, incl Rifles, caught and squared by French HC and eventually picked off never coming out. Cav duel on that flank was a comedy of errors with miss after miss, but finally 1 pt Br LC takes cover successfully. Big action on French right as 4 French units force far right with two FM and an assault and 2 survive the game, chewing up British inf that are fed in. 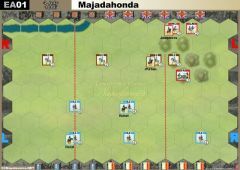 British dice atrocious in early game, Thanks for Tony for good game, final game in two weeks.